With features like an available Swivel 'n Go setup that configures into a table for four people and dual, independent nine-inch video monitors that can display DVD movies, video games or satellite-based SIRIUS Backseat TV, Chrysler's fifth-generation minivan is the obvious choice for satisfying rear-seat riders. It is Reliable in the dead of winter! You will never get stuck in snow or have battery issues. It has a truck axle frame for the van which gives it its weight and size, but it won't seem like you are driving a truck and you still get great gas mileage! I absolutely love the gold bumper to bumper cover that I purchased with the van, however, it doesn't cover a few things that you would expect it to as they told me it would. I have had to replace the passenger mirror 3 times because the Grand is so wide, cars have hit it. Also the undercarriage rattles something fierce. The upside is my van has never gotten stuck in snow nor has it not started in the dead of winter. The dealership has been great to me when things need to be done. I can put 2 or 3 issues under one deductible and I am set! (if I have that many issues) I love that the deductible is only $100, especially now that my car is getting much older! My van has traveled all over the US and never failed me! I will probably always by Dodge/Chrysler/Jeep products as they have always been great to us and our parents proudly made them for 30 years! I love a grand caravan good overall van. We love her Dodge grand caravan very pleased with it we haul stuff in it never had a problem with performance good on gas seating is comfortable the stow and go seats are great the only two negative things I can say is the starters in a bad position it seems to get overheated quite easily and goes bad we had to replace one within less than a year and the council in the roof with the video player has developed a squeaking noise when driving. Great family car for transporting people or stuff around! This van has been a very reliable vehicle. We have the stow and go feature that has allowed us to transport large appliances and furniture. It handles the road really well in ice and snow. I am petite but it find it easy to drive. It just recently started to give me some trouble in that it does not always want to start right away when I turn the ignition on. Otherwise it has been a great vehicle to drive and transport my family. 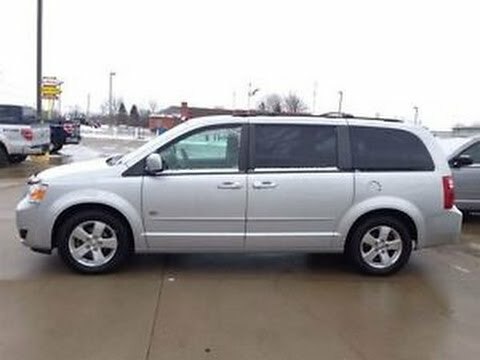 CHRYSLER IS RECALLING 13,350 MY 2009 TOWN AND COUNTRY AND DODGE GRAND CARAVAN VEHICLES. UNUSED ELECTRICAL CONNECTORS FOR THE BLIND SPOT DETECTION SYSTEM MAY BECOME CORRODED AND COULD SHORT CIRCUIT, WHICH CAN CAUSE A VARIETY OF CONDITIONS. IF THE FUSE FOR THIS CIRCUIT DOES NOT BLOW, THE CONNECTORS COULD OVERHEAT AND POTENTIALLY CATCH FIRE. DEALERS WILL SEAL THE POWER CIRCUIT AT THE SUBJECT CONNECTOR AND REPLACE THE FUSE FOR THIS CIRCUIT IF NECESSARY FREE OF CHARGE. THE RECALL IS EXPECTED TO BEGIN DURING FEBRUARY 2009. OWNERS MAY CONTACT CHRYSLER AT 1-800-853-1403.